Click HERE to fill out our online puppy/dog application form, this is a requirement to receive any dog from True Shot Chihuahuas! Click HERE to see a copy of our Sales Contract. We DO have puppies Available at this time! is Another amazing litter here at True Shot! We are so pleased to present 2 boys and 1 girl out of our lovely CH Daisy. Gizmo and Boone have gone to their new homes, and the Cream spotted on White Girl, Callie, is available. 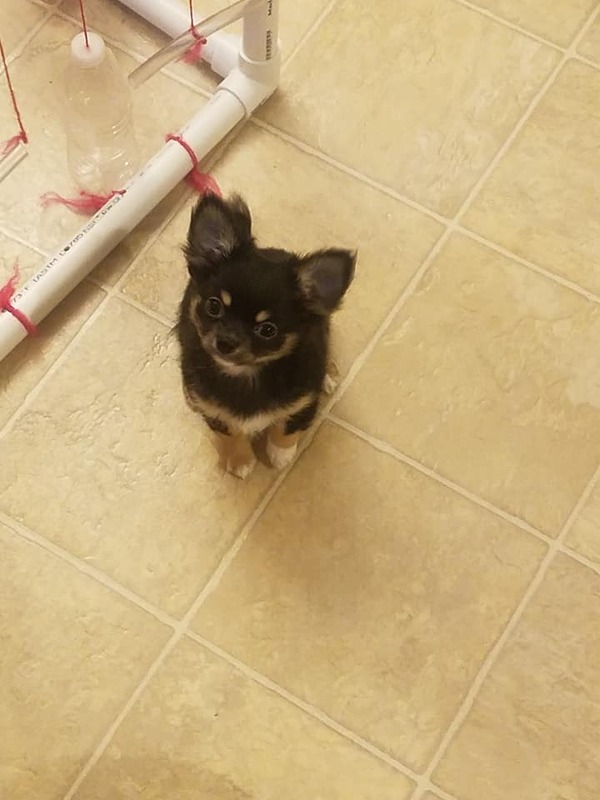 She currently weighs 5.5lbs. Her personality is exceptional! She already loves you, and everyone you know, and everyone you will ever meet. She's playful, sweet, and will throw herself into your lap as soon as you meet her. She gets along well with other dogs and strangers. She has been very well socialized, pee pad trained, crate trained, is accustomed to car rides, nail trims, vet visits, teeth brushing, is quiet, and so much more. Callie will be a wonderful addition to any family. Gizmo - SOLD! Thank you to the Moore Family! Boone - SOLD! Thank you to the Cronin Family! Two little girls and a boy this time from GCH Derby! The longcoat Male and Larger female will be staying here with us to evalutate show potential. Little miss Belle, is now Available to a pet only home with a spay contract. Bella is a hoot. She's always involved in everything. She's sweet, playful, and is going to be a very small girl. We expect her mature size to be well under 4lbs. She loves everyone she meets, is friendly and outgoing with strangers, and enjoys other animals. She has been very well socialized, is crate trained, pee pad trained, is calm and well behaved for grooming, quiet, and well mannered. If you are interested in Belle, please fill out the application above and tell us more about yourself.